Any fan of the Ocean's Eleven films knows the setup: An inside man handles the cards. A high roller rakes in the dough. Two other players, in on the game, lose money hand over fist. And outside, the communications guy sends information to everyone at the table, telling them when to take a hit and when to stand pat. It's a fun fiction, and a great movie plot, but for Phuong Quoc Truong, the big scam wasn't just a story: For an estimated six years, it was his way of life and a multimillion dollar business. In a video released earlier this week by San Diego's 10 News, Truong's team can be seen at their craft, bilking a casino out of more than $25,000. Truong, also known as Pai Gow Jon, started out as the inside man. In 2002, while working as a blackjack dealer for the Sycuan, a casino resort located on San Diego's Sycuan Indian Reservation, he latched onto a new way of making money: conspiring with players to help them win. In 2002, he helped his associates walk away with $525 -- and lost his job. Truong's scam was simple: he performed false shuffles. During the game, he would collect discarded cards in a pile while an outside viewer kept track of the cards' sequence. Later, he would pretend to shuffle them, but would actually keep the pile intact and in order. For the next few hands, Truong's allies would know precisely which cards were coming next. After getting fired from the Sycuan, Truong and his associates took their show on the road, finding new inside men at other gaming venues. His team hit more than 27 casinos in the U.S. and Canada. In the process, they perfected their technique, ultimately reaching the level where they were able to clear several hundred thousand dollars on some nights. On their best night, they netted $868,000 in 90 minutes of playing. In blackjack, players add together the face values of their cards, trying to get to 21 without going over. 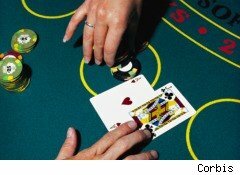 After they take their additional cards -- if they choose to -- the dealer does the same, until he hits 17 or more. If the dealer goes over 21, all players who haven't "busted" win. If the dealer doesn't bust, any player who has gotten closer to 21 than the dealer wins. If the dealer has the best hand, the house beats everyone. Knowing which cards were coming next, the members of Truong's team were able to predict their hands, as well as the dealer's. This let them manipulate the game, ensuring that they won far more often than not. By all accounts, the hardest part of the scam was recruiting the inside men -- dealers who were willing to help Truong and his team cheat their casinos. In fact, it's believed that one dealer they attempted to recruit contacted the FBI, which led to Truong's downfall. But not all dealers are as honest, and Truong's team enlisted quite a few: so far, 37 people have been indicted in connection with the scam. As for Truong, he pleaded guilty to "unlawfully obtaining up to $7 million during card cheats," and was sentenced to 70 months in jail and fines of more than $8.5 million. He also had to surrender several of his assets, including two houses in San Diego, land in Vietnam, a 2001 Porsche Carrera, a Rolex watch, and several other pieces of jewelry. As the saying goes, the house always wins, and Truong's lost homes, emptied bank accounts, and surrendered jewelry attest to the long arm of the law. On the other hand, some experts have speculated that Truong has millions more hidden away, awaiting him after his release. If so, he has a few years left in prison to plan how he's going to spend his ill-gotten gains.